Because of a faulty computer and an email that didn't arrive we nearly missed out of a wonderful opportunity to have a Janet Clare workshop at Busy Bees. Luckily it was spotted in time and Janet can still make the date, as long as we can find sixteen students to come along to the class. 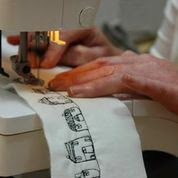 "This workshop is a good introduction to the techniques I use to achieve my appliqué and quilting style. I teach through a series of fun group exercises in the morning and then in the afternoon everyone is free to create their own appliqué blocks or pictures with my help. I’ll help people design their own pictures and can draw any templates required (well, I certainly have a good try!)." 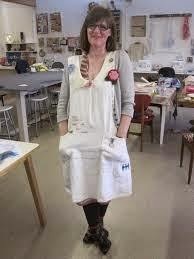 If you haven’t been lucky enough to come across Janet's work here is a little bit about her. Janet Clare is an artist, textile designer, teacher, author, quilter and all round creative thinker who is inspired by words, sayings and lovely phrases that she comes across and also by children and the joy they find in the mundane. Janet captures these nuggets, thoughts and ideas in scrapbooks and sketchbooks which she describes as ‘quite literally the most inspiring thing I own’. From these she creates inspirational and lively designs for quilts and stitcheries that combine her unique jointed appliqué templates and free motion machine drawing technique. A regular blogger and Pinterest fanatic, Janet has embraced a world-wide ‘virtual’ community of quilters and designers and gets great pleasure from sharing and discussing her projects and ideas with fellow quilters all around the world. 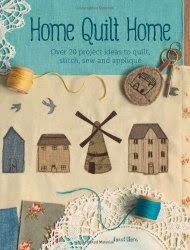 Janet has created a range of quilt and stitchery patterns, written four books and designed three fabric collections in collaboration with Moda, one of the leading international fabric manufacturers and a great favourite at Busy Bees. Her work features frequently in patchwork and quilting publications and as an experienced speaker and teacher, she regularly host talks and workshops focusing on the design process and the creative techniques she uses. If you would like to come along give the shop a ring on 01633 810801 and do it as soon as you can, I think we are going to get a lot of telephone calls!